A great baby gift or kids birthday present! 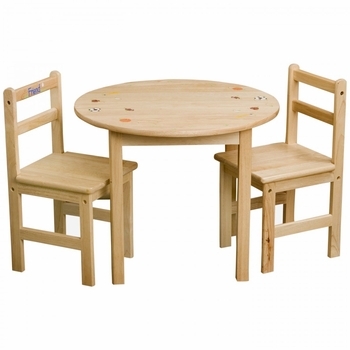 These round kids table and chair sets are the perfect place for your child's creative activities and crafts. Made of durable rubberwood, this set is built to last and comes customized with your choice of hand-painted design and personalization on the chairs. We can personalize each of the two chairs with a different name.Note: If no second name is chosen, the second chair will have no name painted on it. Many customers add the word "Friend" to the second chair. The table measures 21 inches tall and is 26 inches in diameter. Each chair measures 24 inches high and the seat is 12 by 12 inches square. The seat is 13 inches from the floor. Available in natural wood only. Adult assembly required - hardware and simple instructions included. All Paint Certified Lead Free for safety.